Crosby Hop Farm is a leading hop grower, merchant and processor offering quality hops from around the world. It is a Salmon-Safe certified grower and Certified B Corp supplier. 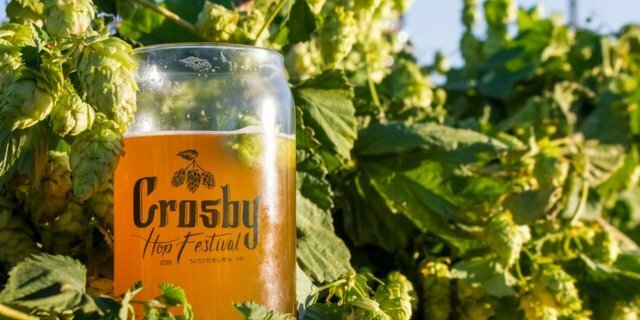 This year at the Craft Brewers Conference and BrewExpo America 2018, Crosby Hop Farm will be pouring a total of 24 beers over three days (brewed with hops from Crosby Hop Farm or Indie Hops) in its 3rd floor lounge, feature dozens of varieties on display and share details on its expanded partner grower program. It works directly with Freestyle Hops in New Zealand to source 13 hop varieties for the 2018 harvest and beyond. Many popular New Zealand varieties will be available by early summer in both whole leaf and Crosby produced pellet options. Plus, CHF has added three new, in-demand varieties — Comet, Strata and Meridian (from Cultivar W12244) — to its growing catalog of 80+ varieties. When stopping by the lounge or the booth, enter to win a trip for two to Portland during harvest. Crosby-grown Comet, will be available in harvest 2018. Strata — Inquire for spot availability from CHF and Indie Hops. Will be available for 2019 contract orders. Meridian (from Cultivar W12244) — Available now for spot and contract orders. You can also shop online, with real-time availability and pricing information right here. YCH HOPS is a grower-owned global hop supplier focused on providing the highest quality hops and brewing solutions to brewers of all sizes. At the 2018 Craft Brewers Conference, it wants to show you its latest hop products, including Cryo Hops and American Noble Hops. Both serve their own unique purpose in the brewhouse and represent the latest in hop processing technology. Cryo Hops is the concentrated lupulin of whole hop cones, providing variety-specific, enhanced aroma and flavors, as well as increased efficiency and yield, perfect for hoppy ales. American Noble Hops are the concentrated bract of whole hop cones providing a quality low-alpha, high aroma and flavor product, great for a wide variety of traditional style beers including pilsners, saisons and sours. This year’s booth and beer-tasting lounge will display Hopsteiner’s full line of farm fresh hops and hop products, including new developments from their breeding program. Hopsteiner’s booth will include a beer-tasting lounge featuring four unique beers that highlight Hopsteiner’s flavorful and aromatic experimental and proprietary hop varieties. The lineup is: Humulus IPA, brewed by Tennessee’s Mantra Artisan Ales, featuring Hopsteiner’s X06297; Pegasus Pale Ale, brewed by Atlanta’s MondayNight Brewing, featuring Hopsteiner’s X09326; Helles, brewed by Nashville’s own Blackstone Brewing Co., featuring Hopsteiner’s X04190; and of course, Hazy IPA — this year’s mega-trendy, New England-style India Pale Ale, brewed by Nashville’s Yazoo Brewing Co., featuring Hopsteiner’s Bravo, Calypso and the ultimate juicy and fruity combination of Denali and Lemondrop. In addition, Hopsteiner is proud to have donated Hallertau Mittlefrueh, featured in this year’s Craft Brewers Conference Symposium Beer — Mockingbird Maibock Lager — brewed by Tennessee Craft Brewers Guild.